This post is sponsored by the Alaska Seafood Marketing Institute. As always, all opinions are my own. Thank you for supporting the brands that keep Lively Table running! In this Lent season, you may be searching for more easy seafood recipes. If so, you’ve come to the right place! 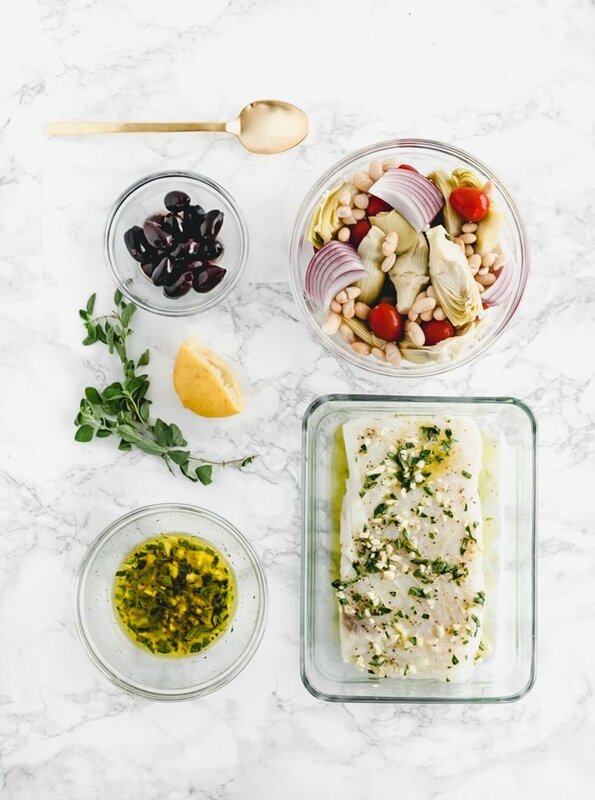 I’ve got an easy and delicious Mediterranean influenced fish recipe for you today that checks all the boxes when it comes to dinner. Even if you don’t observe Lent, it’s a great time to eat more seafood (is there ever a wrong time? 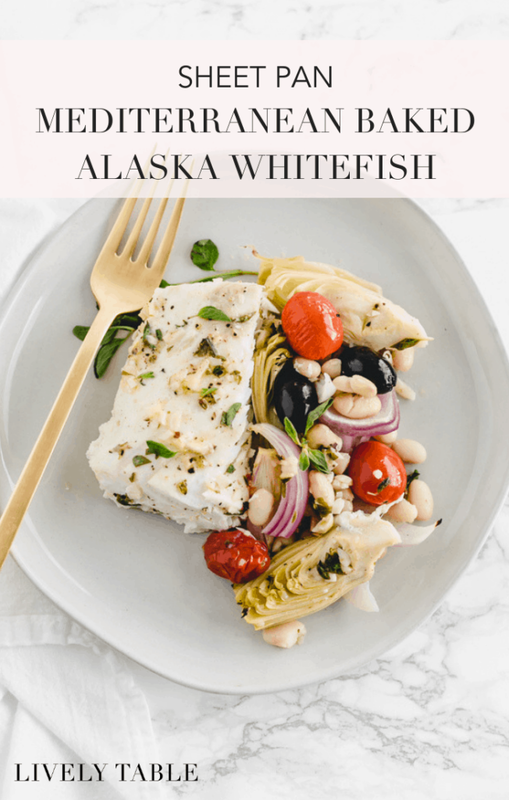 ), because it’s also Alaska whitefish season – a great time to try new recipes with fresh, wild and sustainably caught whitefish from Alaska. Alaska’s glacial waters produce some of the purest, high-quality seafood in the world! 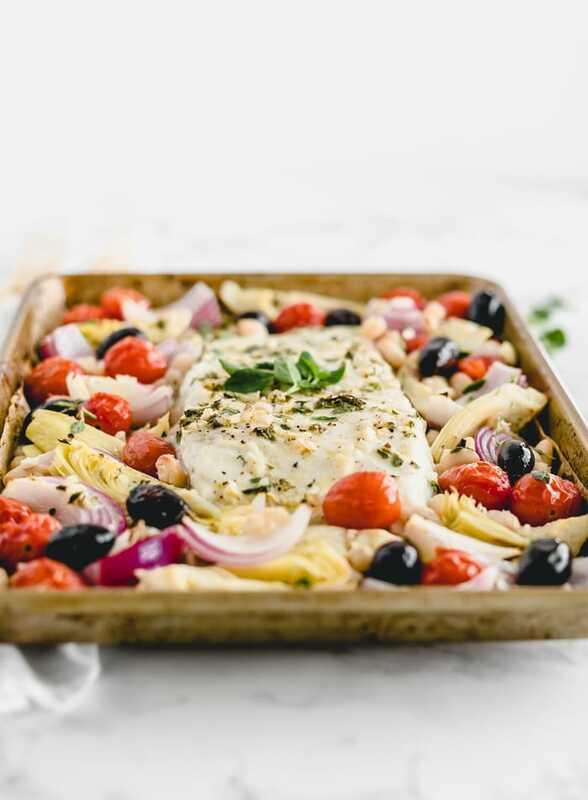 Fresh Alaska whitefish is perfect for this Mediterranean sheet pan dinner. 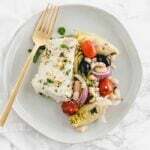 I chose halibut because it’s one of my favorites, but cod and sablefish also work well here. The firm, meaty texture and mild flavor of these Alaska whitefish is perfect for a simple, flavorful sheet pan meal. 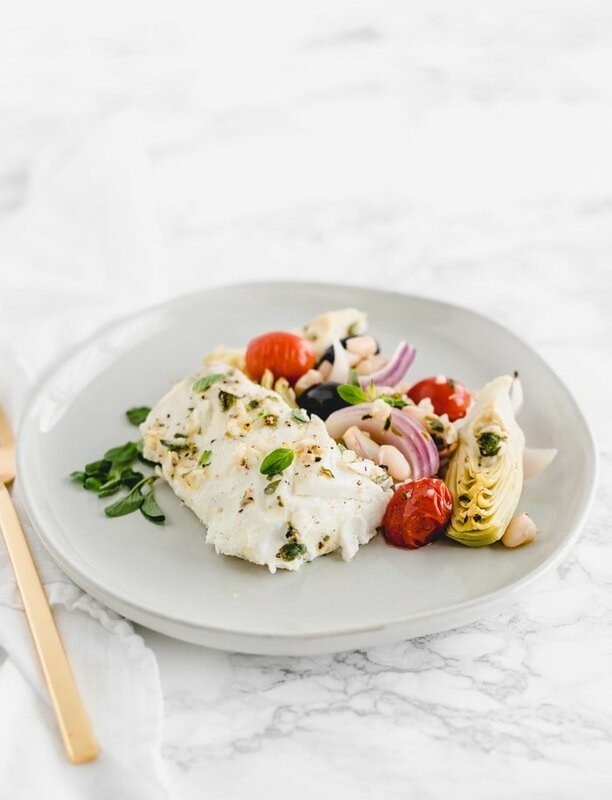 This Mediterranean baked Alaska whitefish is so easy to make, it will have you excited to make seafood all the time. All it takes is one easy marinade and a few pantry staples to create a healthy, delicious dinner that goes from fridge to table in under 30 minutes! Make the marinade while the oven heats. Pour half of it on the fish and let it soak up all of that delicious flavor. Prep the veggies. Cut the onion and add everything to a large bowl. Pour the other half of the marinade on the veggies. Put it all on a sheet pan and bake! While dinner is cooking, you can clean up the few dishes you used and make some quinoa or couscous to serve with this dinner, if you’d like. This easy sheet pan dinner tastes amazing, too. 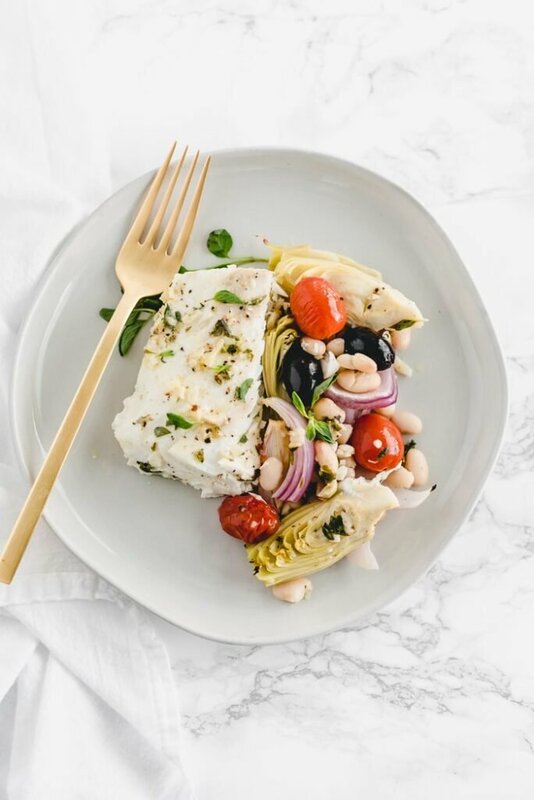 It’s full of Mediterranean inspired flavors, like garlic, oregano, artichokes and olives, which also happen to make it heart healthy and filling. Easy, tasty, healthy, and filling – what more could you ask for in a meal? 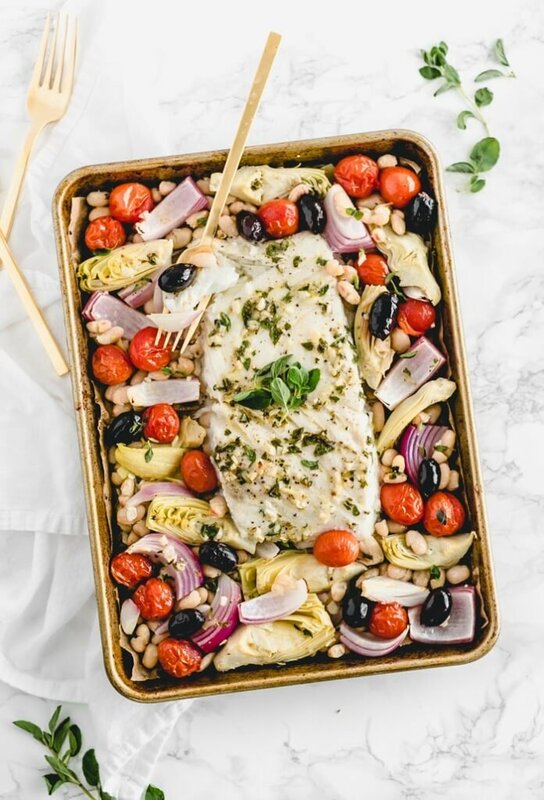 Be sure to swing by the seafood counter and #AskForAlaska next time you’re at the grocery store so that you can make this delicious Mediterranean sheet pan dinner yourself! This type of sheet pan meal is definitely something I would make! Love all of the Mediterranean flavors! Thanks Lindsey! I love them too!